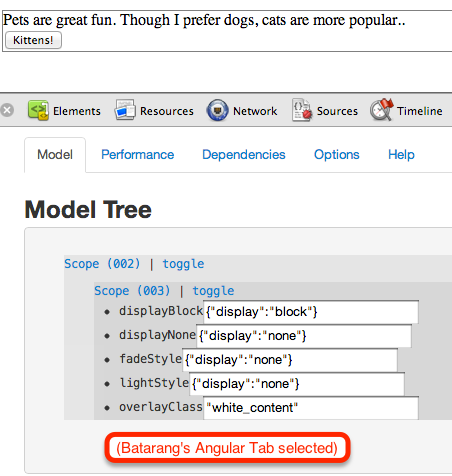 Paul Hammant's Blog: Angular for Designers. I’m going to have another go at explaining one ‘best practice’ for AngularJS. I previously blogged about it here and here. A colleague asked me “Is it about graceful degradation?”, and the answer is no it’s not. It is about the ability of a designer or a UX specialist to lead the behavior as well as the aesthetics of a web-application, during development. Note too that all the content for this app is static HTML. Normally you’d use Angular to bind in data from JSON. The two “previous blogged about” articles do just that. For this blog entry, I’m only trying to sell the view-all-panels-together aspect of the proposition. This is the big benefit for me. Designers, or indeed newbies to a project, will load up an Angular page in a running app with Angular turned off. They will then be able to see all the panels/divs/overlays concurrently visible within the page, whether or not the application would function like that. All will be very-nearly styled appropriately, as CSS will still work as it would in the final app. Here is the same one-page demo as before, with Angular ‘turned off’. 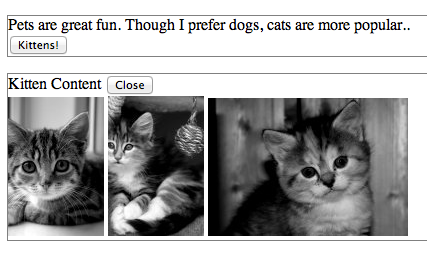 Note the ‘kittens’ button does not function. Here is the source for it. I swear the only difference is the ‘script’ tag that would have dragged in Angular - I’ve commented it out. Here is the source for it. The only difference versus the previous one is the ng-class usage has been swapped ‘back’ to a hardcoded class=”white_content”, as per ordinary HTML usage. Tin.cr - edit your CSS while playing with a functional AngularJs app, and save directly back to the file-system (before doing a commit).